Overview: This is an advanced sheet metal course. Participants will be trained to work on items such as small battery contacts, aircraft mounting brackets, electronics enclosures, larger stove/oven components, or auto panels. Onsite Training: This and all Design-Engine courses are offered at our location as well as onsite at your facility. Call to speak to an account manager to arrange a class at 312.226.8339 today. Projects: Calculate the developed length of material needed. 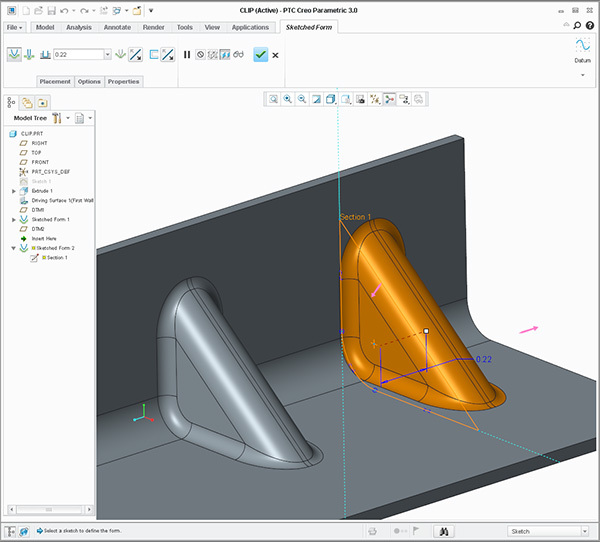 Creo Sheet metal accounts for bends of different radii and material thickness. Convert IGES file with inconsistent wall thickness and punch geometry into a Pro/Sheetmetal part ready for production. Curriculum can be combined with Creo Surfacing tools for automobile sheet metal functions or for smaller battery contacts. Prerequisites: Prior experience with Creo Sheetmetal and a willingness to learn. Discuss Creo 5.0 & 6.0 iconography.